Good day Databearians and welcome to another exciting data adventure. We go through life, day in and day out, asking ourselves “What if?”…….Today’s Power BI adventure is just about that. In the latest Power BI update for August 2017, they’ve released this wonderful functionality which enable users to quickly create multiple variables to be used as part of their “what if analysis”. The possibilities with this is literally endless, giving users and businesses from various different backgrounds the flexibility to design a solution which will give them the answers and insight they so desperately need. 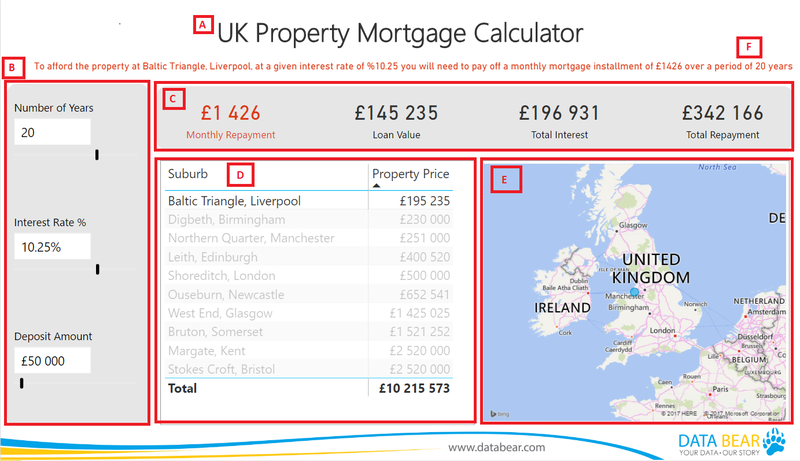 To showcase this functionality we’re going to create a simple demonstration (using the ‘What if Parameters’ of course) to create a UK Property Mortgage Affordability Calculator. 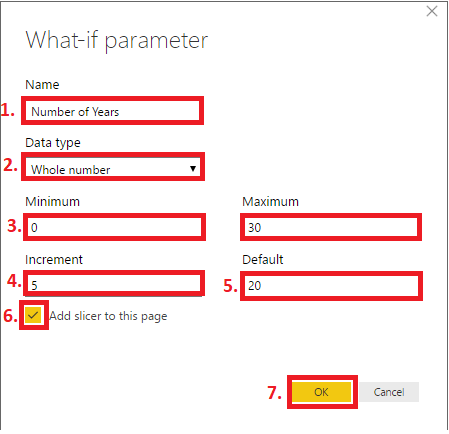 While this won’t change the world for most, it will help give users a basic idea of how ‘What if Parameters’ can be used within the Power BI Desktop application. Years: Over what period (in years) will the mortgage be paid? Interest: What % interest (usually offered by the various banks) is likely to be paid over the given period? Deposit: What deposit (if any) will be paid on the property? This will of course lower the amount you will have to pay back to the bank every month. What will my monthly repayment be on the mortgage (given the variables identified) – and can I afford it? What is my total loan value? How much interest will be paid over the duration of the mortgage? What will the total repayment be (including interest)? I have a simple table called ‘Properties’, in which I manually entered some property listings. For this example I’ll only be using the UKs top Suburbs to live in (according to Google), rather than show actual property addresses (just to be on the safe side). You can of course source real property addresses from a property listing website, which often comes standard with the price, address and lat/long (x, y coordinates) details. Now that we have data, let’s add some ‘What-if Parameters’ shall we?! To cover the variables highlighted above, let’s start with years, then add interest and deposit in the same manner. 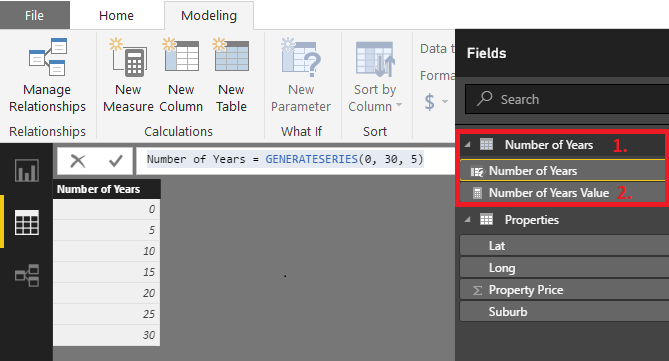 In the Power BI Desktop (August 2017 Update) Modelling Tab, under the ‘What if’ group, we will now see a button called ‘New Parameter’. Click this button to add your first ‘What If Parameter’. Fill in the parameter name. Let’s name our parameter ‘Number of Years’. Choose a data type for your parameter. Options include, whole number, decimal number and fixed decimal number. For our parameter we need our values to be whole numbers. Choose a minimum and maximum value for your parameter. Lets choose a minimum value of 0 and a maximum of 30 years. Choose the value increment. We want to be able to select the number of years in increments of 5 years so we will have options of 5, 10, 15, 20, 25, and 30 years. Choose a ‘Default’ value (if you require one). In our case, let’s assume that most mortgage loans take 20 years to pay off, so we’ll enter 20 as the default value. Check box if you want the parameter to add a slicer for your new ‘What If Parameter’. If left unchecked it will generate the parameter but not add a slicer to your canvas. Click OK to submit and create the parameter. Ok so now a number of things happened when we submitted the creation of the ‘What If Parameter’, let’s dig deeper to understand. A new measure was created named ‘Number of Years Value’ using a DAX query called SELECTEDVALUE() – which will help us filter our results when we change the ‘Number of Years’ variable with the slicer. On the canvas our ‘What If Parameter’ added a slicer for ‘Number of Years’. So while you could do all of this manually – the ‘What If Parameters’ did it much quicker and saved us allot of time, which makes us very happy customers – right?! One thing to remember is to format the table or measure values to represent the values in the format you need them to be in. For example, if your table values represent a percentage, edit the column values as % Percentage values. Interest: Name the ‘What If Parameter’ ‘Interest Rate %’. Because we are working with percentage, enter the data type as a decimal number, the minimum number as 0.01 (or 1%), the maximum number as 0.15 (or 15%) and the increment as 0.0025 (or 0.25%). Leave default as blank and make sure the check box is on for ‘Add slicer to this page’. Deposit: Name the ‘What If Parameter’ ‘Deposit Amount’. Enter the data type as whole number, the minimum number as 0, the maximum as 1000,000 and the increment as 10,000. Again leave the default as blank and make sure the check box is on for ‘Add slicer to this page’. Now we have three slicers and four tables, one table for ‘Properties’ (Our data table), one for ‘Number of Years’, one for ‘Interest Rate’ and our final one ‘Deposit Amount’ (Our What If Parameter tables). Total Price = CALCULATE(SUM(‘Properties'[Property Price])) – is the sum of the property values from our ‘Properties’ table. Number of Payments = [Number of Years Value]*12 – is the value (which will be selected from the ‘Number of Years slicer) multiplied by 12 to give us the total number of monthly payments over the mortgage period. Monthly Interest Rate = ‘Interest Rate %'[Interest Rate % Value]/12 – is the value (which will be selected from the ‘Interest Rate % slicer) divided by 12 to give us the monthly interest rate % payable over the mortgage period. Loan Value = ‘Properties'[Total Price]-‘Deposit Amount'[Deposit Amount Value] – This is the total property price minus the deposit value, which will give us the amount loaned from the bank. Monthly Repayment = ([Loan Value]*[Monthly Interest Rate])/(1-1/POWER((1+[Monthly Interest Rate]),[Number of Payments])) – This calculation is a little bit more complicated, but in essence calculates the Monthly Repayment for the variables we’ve added with our ‘What If Parameters’, i.e. Property Price (From the Property Table), Monthly Interest Rate (derived from our Interest Rate % parameter), and Number of payments (derived from our ‘Number of years’ parameter). If you are interested in the logic behind this formula, you can go HERE for more details. Total Repayment = [Monthly Repayment]*[Number of Payments] – The monthly repayment value multiplied by the total number of payments over the selected mortgage period. Total Interest = [Total Repayment]-[Loan Value] – Because we know our total repayment amount, we can just subtract the loan value from the total repayment to give is the Total Interest to be paid. Suburb Name = SELECTEDVALUE(‘Properties'[Suburb],”Multiple Suburbs”) – This measure as used also in the creation of ‘What IF Parameters’ will come in handy with our next measure called ‘Description’ and will in essence return the selected property / suburb name. If no property / suburb is selected, it will return the words “Multiple Suburbs”. Description = “To afford the property at “&[Suburb Name]&”, at a given interest rate of %”&’Interest Rate %'[Interest Rate % Value]*100&” you will need to pay off a monthly mortgage installment of £”&ROUND([Monthly Repayment],0)&” over a period of “&ROUND(‘Number of Years'[Number of Years Value],0)&” years” . I’ve added this last measure, which we will use to show the key metrics in a text sentence, based on the parameters selected from our slicers. Once all our measures have been added and formatted accordingly, let’s create our UK Property Mortgage Calculator dashboard shall we? B. As our ‘What If Parameters’ have already been added, just place them accordingly by clicking and dragging into position. C. Add the measures, ‘Monthly Repayment’, ‘Loan Value’, ‘Total Interest’, and ‘Total Repayment’ as Card visuals and align / format accordingly. D. Add a table visual and place the ‘Suburb’ and ‘Property Price’ values in the table and format the table accordingly. 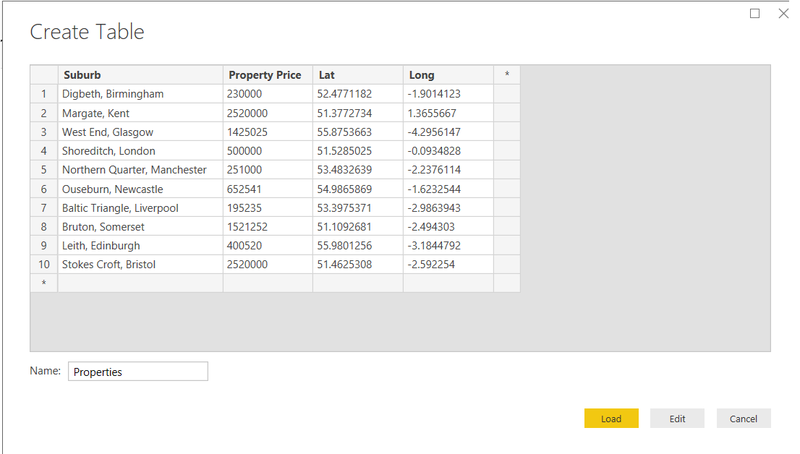 E. Add the Power BI Map visual and place the Lat column on ‘Latitude’, the Long column into ‘Longitude’, Suburb into ‘Legend’ and Monthly Repayment into ‘Size’. F. Finally let’s add the ‘Description’, measure underneath the heading as a Card visual to finish our affordability calculator. Notice the dynamic text we entered change based on your selection, giving you a summary of the affordability for each property. 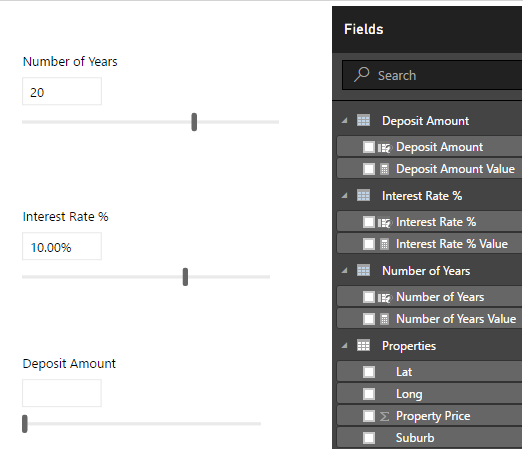 It also shows you on the Power BI Map, where the property is situated and the corresponding monthly repayment values in comparison to other properties. Thank you for joining us on the journey into the land of mortgages (I know, very exciting), I hope you will find as much value in this new ‘What If Parameter’ functionality as we have. Until next time, stay safe, and be blessed!! !